HNK Šibenik is a Croatian football club based in the city of Šibenik on the Croatian coast. The club was formed in 1932 under the name RSD Šibenik ("Workers' Sport Association Šibenik"). The first president, Dr Martin Čičin-Šain, was only appointed to this role during the first board meeting which was held in August 1933. 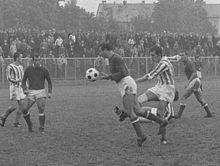 They played in a stadium in the area of Crnica, next to the La Dalmatienne factory in Koprivnica. The playing field was officially opened on 31 May 1936. The first matches played were part of a 1936 tournament between Šibenik, Osvit, Split and AŠK. Around the same time the first registered football club in Šibenik was also formed. This club was called Osvit and it was responsible for the construction of Stadion Šubićevac. The club played its first official league match in 1946 under the name FD Šibenik and the very next year it was crowned the champion of the Dalmatia region. The club's new home ground was opened on 1 May 1948 and bore the name of "the people's hero" Rade Končar. In 1950–51, Šibenik finished top of the Croatian Republic League and gained promotion to the Yugoslav Second League for the first time in their history. However, they were relegated immediately and it was not until 1954–55 that they returned to the second division. In 1957, the club made it to the semi-final of the Yugoslav Cup. In 1983 Šibenik made it back to the Yugoslav Second League, where they played in the West Division, composed from 18 clubs from Slovenia, Croatia, Bosnia-Herzegovina and Vojvodina. In their first season (1983-4) they finished fourth, while in 1984-85 season they came close second, only three points behind the champion, Čelik Zenica, thus falling short of winning promotion to the Yugoslav First League. This was their best result in Yugoslav Second League ever. After holding the middle position of the table for the next couple of seasons, Šibenik finished fifth in 1987-88 season. They defended their fifth place in 1988-89 season, the first Yugoslav Second League season which featured a unified format instead of two divisions (West and East), as well as in 1989-90 season. Šibenik played in the Croatian First League for 12 consecutive seasons, from 1992 until 2003. In 2006, the club finished first in the Croatian Second League's southern division and returned to the Croatian First League. In the 2009–10 season, Šibenik finished 4th in Prva HNL, which was their best result ever, and thus qualified for the 2010–11 Europa League for the first time in the club's history. They were eliminated in the second qualifying round by Anorthosis Famagusta FC 2–3 on aggregate. In the 2011–12 Prva HNL season, the club finished 14th and were relegated to Druga HNL. In the following season, Šibenik finished 4th, but due to financial difficulties, they were once again relegated to Treća HNL. In the 2013–14 season, Šibenik finished in second place with their marksman Miro Slavica scoring 30 goals to take out the league's top goalscorer award, but failed to lead his side to promotion. At the end of the 2014–15 season, Šibenik gained promotion to Druga HNL, topping the 3. HNL - Jug. Mirko Labrović took over as manager in 2015. They finished close second to Cibalia in 2015–16, failing to beat them in the last match of the season and thus failing to win direct promotion to First Croatian League by only one point. Šibenik played against Istra 1961 in relegation play-offs on May 29 and June 1, 2016. Both matches ended 1–1 and Šibenik lost the play-off after penalty shoot-out. Last updated on 10 September 2010. The following NK Šibenik players have been capped at full international level. Years in brackets indicate their spells at the club. ^ "First Team". HNK Šibenik. Retrieved 30 July 2018. Wikimedia Commons has media related to HNK Šibenik.